Unsightly veins in the legs can be the result of heredity, health conditions, standing professions and even pregnancy. Spider veins are smaller than varicose veins and though they have the blue/purple appearance, they don't bulge nor are they painful. They are more spider web like in appearance and usually heredity, pregnancy and weight problems can be blamed. Whereas varicose veins are more obvious and they can cause pain, fatigue and even leg ulcers. Non-functioning valves within a blood vessel cause varicose veins. The function of our veins is to return blood back to the heart. When a valve doesn't function properly, it causes blood to flow backwards into the vein. Various plants that are known for increasing blood circulation and helping to support vein health can be utilized in the form of herbal oils and aromatherapy. 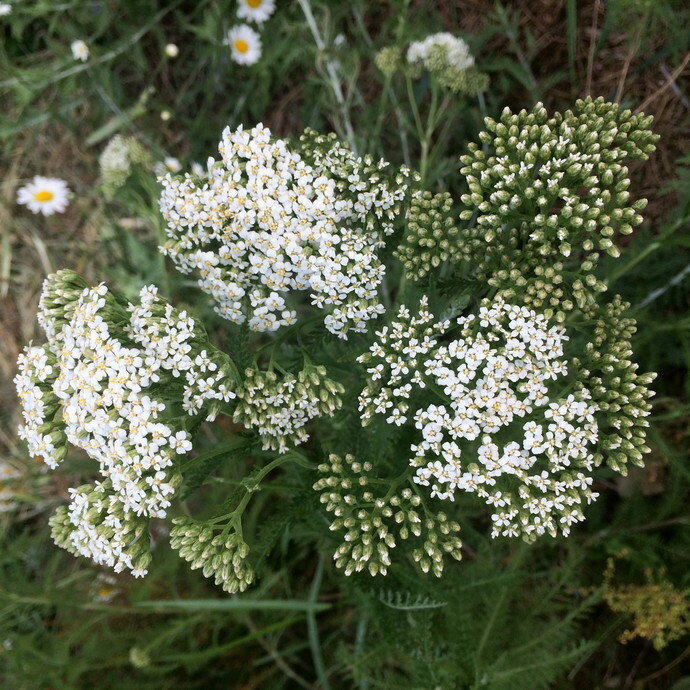 White Yarrow (Achillea millefolium) used to be called "soldier's wound wort". Wort means a type of plant and yarrow is a wound plant. To be knowledgeable of medicinal plants was often the difference between life and death as a result of bleeding out and infection. Named for Achilles, the Greek warrior who used the plant for his wounded soldiers, it is one of the oldest medicinal plants known to man and holds its place in folk medicine as a cure all. The white plant found by the wayside is the type to look for, not the yellow garden varieties. It is a woody stemmed perennial plant with beautiful umbel flower heads and lacy green leaves. The flowers and leaves are collected and used fresh or dried as an infusion with organic, cold-pressed, extra-virgin olive oil. The resulting yellow-green oil contains antimicrobial, anesthetic and styptic properties which make it very useful as a blood remedy. Yarrow is known as the "great normalizer of the blood". As an herb that tones and moves stagnant blood, Yarrow is useful for unsightly spider veins and varicose veins. Yarrow supports the veins by stimulating and increasing a slow, sluggish circulation. This improves the appearance of varicose veins over time. Yarrow oil can be made into a salve to become a valuable part for a home first-aid kit. It is good for bruises, shaving nicks, paper cuts, varicose veins, hemorrhoids and nosebleeds, all conditions where blood collects (what is called stagnant blood) and there is swelling. The section for balms and salves has this herbal oil in a salve form without essential oils. Adding essential oils that contain astringent properties, act as a tonic for the circulatory system, and reduce inflammation adds extra value to the Yarrow oil as a way to help prevent and reduce unsightly veins. The addition of these plant essences gives you a soothing massage oil that can be used daily to improve the appearance and health of your legs. 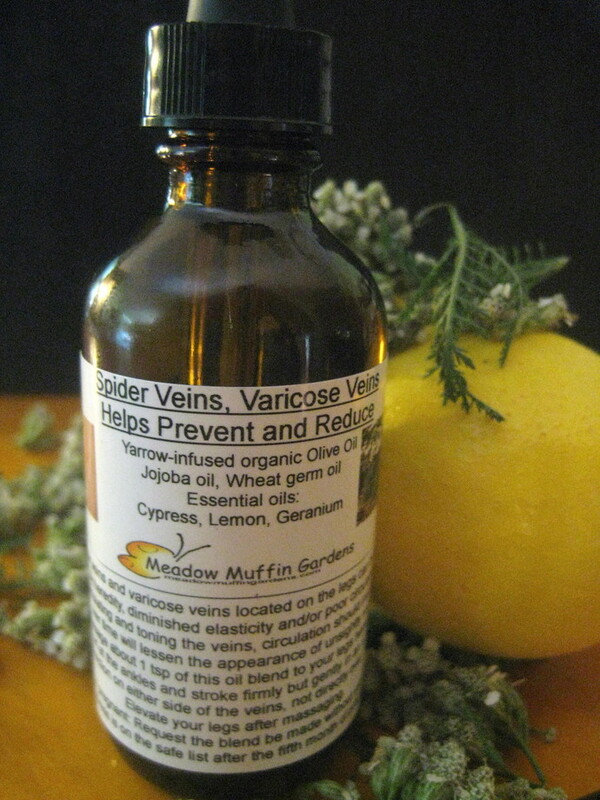 Cypress, Geranium and Lemon essential oil have a good reputation for helping with varicose and spider veins. They promote circulation and blood movement, help constrict the blood vessels, and strengthen the capillary walls in the blood vessels. Twice a day, use about 1 tsp of the blend to massage your legs. Start at the ankles and work upwards with firm but gentle strokes. For bulging veins, work on either side, not directly over them. Elevate your legs after your massage. Be patient, everything takes time. If you are pregnant request the base oil be without the Yarrow. 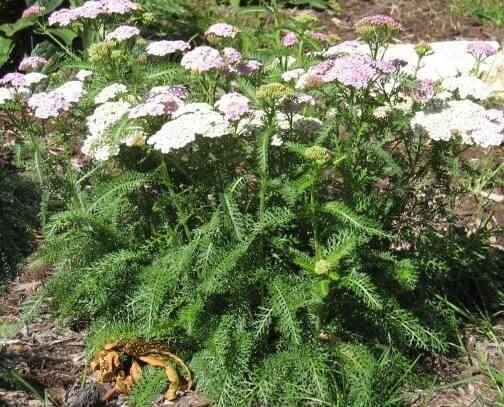 Yarrow should not be used during pregnancy. The Cypress essential oil is on the safe list once you are beyond five months of your pregnancy. People who stand for hours at a time are at a greater risk for developing these unsightly veins because the blood is unable to circulate properly. As often as possible, try to take walks to get the blood moving. Try to remember not to cross your legs while sitting. Crossing your legs can put unwanted pressure against your veins. When possible, sit with your legs elevated. This helps the veins in their efforts to fight gravity. Inflammation reduces blood flow, so try to eat a diet full of anti-inflammatory foods. Support stockings and tights are a way to boost circulation. They may not be able to alleviate the condition but they can provide comfort as they help put pressure on the veins to get the blood moving. To help reduce excess swelling on those painful days, apply a cold compress soaked in witch hazel. Eat a high fiber diet and try to avoid constipation. Bearing down puts strain on the veins. This massage oil blend comes in a 1 oz., 2 oz. or 4 oz. amber glass eye dropper type bottle.